The Caucasus summoned me and I obeyed. Now I am back where I started, at home in Wales, trying to make sense of it all. I fell in love with the Caucasus. I don’t want to over-analyse why I love it so, but I have John Wurdeman’s words ringing in my ears – thoughts need decantation, not only wine. Stories need a beginning, a middle and an end, so here are my final thoughts to round off the tale – personal musings on a few threads that feel important to me after my four visits to the region. I knew beauty and joy in the Caucasus – that is the front-page headline. While I can also experience joy at home, I came back to my own hearth feeling emotionally richer and more content. I don’t wish to lay upon the peoples of the South Caucasus the allegation that their region is perfect. It is not. But I found it profoundly beguiling and nourishing, a reminder to me of the importance I attach to wild nature and to the life of the spirit. There is a sense of the sacred in the Caucasus; you feel it in the air and it is a complex and many-layered thing. A deep understanding of spirituality in the Caucasus would probably take a lifetime of study, but what is immediately striking is that this part of the world cleaves to religious belief – and this after seven decades in an atheist empire, the Soviet Union. When my mind dwells on Caucasus spirituality, I personally tend to think of the Georgian region of Tusheti, where there are Christian churches but also many pagan shrines called “khati” adorned with animal horns. Both in Armenia and Georgia, the world’s oldest Christian nations, paganism lives on even today as an element in the spiritual mix. Falling in love with the Caucasus is a fate that has befallen many visitors. I am not alone! This land of resilient people and awe-inspiring peaks higher than the Alps gets under the skin of many a traveller and never leaves them. It is the polar opposite of bland. Writers, of course, leave the fullest accounts of their passion. One of my main learnings has been the discovery of at least a small portion of the literature inspired by the Caucasus and savouring just how wonderful it is. Many of the titans of Russian literature have gone to the Caucasus and been shaped by their travels – Alexander Pushkin, Mikhail Lermontov, Leo Tolstoy, Maxim Gorky, Osip Mandelstam, Boris Pasternak and Vasily Grossman come to mind. If you took the Caucasus out of Russian literature it would leave a gaping hole. I wonder whether any other mountain chain in the world has served as such a powerful muse. Tolstoy’s case is particularly striking because Caucasus themes inspired him at every stage in his career, after he volunteered for the Russian army at the age of 23 to fight against the Chechens. Even his final novel, the magnificent “Hadji Murád”, is set in the North Caucasus. He wrote it half a century after he first went there in the early 1850s and he wrote it during a period when he spent much of his time denouncing fiction. “Hadji Murád”, an almost unbearably moving tale of the horrible waste of war, is one of the masterpieces of world literature. Looking beyond Russian letters, English-language authors too have found their voice after setting foot in these lands. Take Englishman Douglas Freshfield, a member of the first team to climb Mount Kazbek back in 1868. He also wrote extensively, and very touchingly, about the Caucasus. In his two-volume work “The Exploration of the Caucasus”‘ Freshfield seeks to play down his literary skills and describes himself as a matter-of-fact mountaineer. But Freshfield was so much more than that – he was a writer. 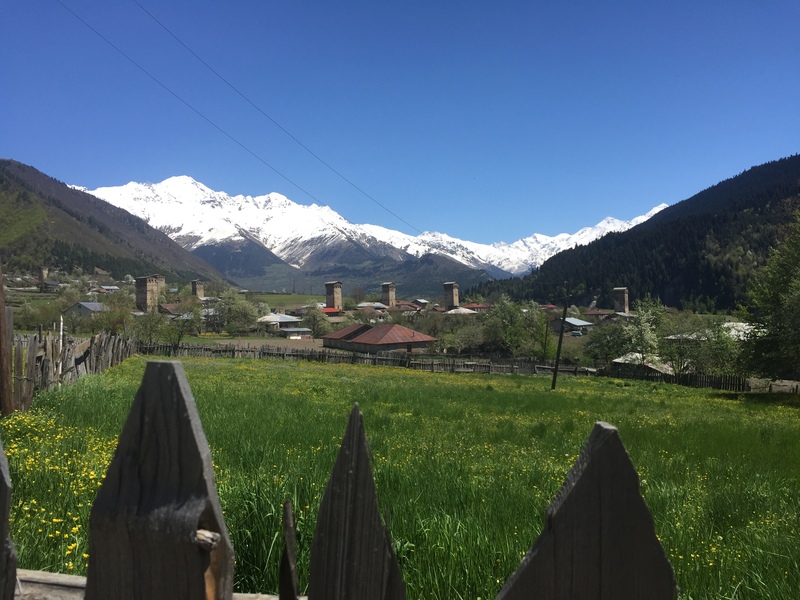 On one of his journeys he travelled through some very remote parts of Abkhazia, entering by way of Svaneti, up to the northeast. In a chapter entitled “The SoIitude of Abkhasia” he describes the view on the upper reaches of the Kodor river. Freshfield makes it clear that for him the Caucasus was a welcome change from the roar of late 19th century London; it was an experience of spiritual solace. In our own times too, the Caucasus has proved to be a muse. U.S. journalist Wendell Steavenson lived in Tbilisi at a time of economic hardship and acute power shortages in the 1990s. She fell head over heels for the place and proceeded to write “Stories I Stole”, an electrifying love song to Georgia. It is a non-fiction work of great beauty and her attention to detail is Tolstoyan. One friend of mine has told me that I have become a Georgian “infatué”. (I know, this word isn’t in the dictionary. But it should be.) I plead guilty and when I read Steavenson I feel I am in good company. I have heard the view expressed, in my own country, that the Caucasus region belongs to “the periphery”, whatever that means exactly. A big part of my learning is that in my gut I know that the Caucasus is not peripheral. It has become important in the contents of my head and I am still on a journey to understand it more deeply. The Caucasus region is evolving and changing and trying to find its place in a turbulent world. So, I would like to look briefly at forces that are pulling the three countries of the South Caucasus further apart and forces that are bringing them closer together. That same Russia, whose poets have sung the praises of the Caucasus, has been a deadly player in the geopolitical game in these parts and still plays a central role, very much in the spirit of the classic adage “divide and conquer”. Travelling through the region, I found that I had to decant my thoughts on Russia. To change the usual metaphor a little, Russia always felt like the bear in the room. Taking a deep historical perspective, it is clear that Russia has had within it a strong expansionary dynamic. British historian Orlando Figes, in “Natasha’s Dance A Cultural History of Russia”, writes: “From the capture of Kazan in 1552 to the revolution in 1917, the Russian Empire grew at the fantastic rate of over 100,000 square kilometres every year.” The hunt for lucrative furs first drew the Russians on. Today, Russia cannot expand in the same way. But this long history of pushing out the boundaries of the empire for earthly gain surely means that it has no model for how to build a friendly, co-operative relationship with immediate neighbours. It has to build such a model from scratch. Several of the countries that have escaped Russia’s grasp, such as the Baltic states, Ukraine and Georgia, are not on friendly terms with the Kremlin. I pick up too another sort of restlessness in Russia’s history, a yearning to be relevant on the world stage. At its best, this has been pitched in high-flown idealistic terms. Fyodor Dostoyevsky, in a speech on Pushkin in 1877, said: “Yes, the vocation of the Russian man is indisputably an all-European and a world-wide vocation. Perhaps indeed to become a genuine complete Russian can only mean (in the last resort, let me emphasize) to become the brother of all men.” In the light of 20th century history, these words have a hollow ring. I think Dostoyevsky was sincere and I am left with a feeling that today’s nuclear-armed Russia, with its bristling fleets and fighter planes, is still searching for its vocation in the world and is not a happy bear. And this disgruntlement is not good for Russia. Nor is it good for its neighbours or for the world. One priority for the countries of the South Caucasus is to shape and implement policies towards Russia. When the Soviet Union tottered towards its end there was ebullience, a sense of release. Georgia, Armenia and Azerbaijan had their troubles when the Soviet empire fell and trade links were disrupted, but they all shared a sense of turning a page of history and starting anew. In the first instance, both Georgia and Armenia moved away from Russia. It is fascinating to read this now because Armenia has since done a U-turn and become a close ally of Russia. In Yerevan there are now Russian newspapers, books and theatre. Even more to the point there are Russian soldiers, invited in by the government to provide defence and patrol the border with NATO member Turkey. Georgia, on the other hand, actually fought (and lost) a war with Russia and pro-Russian separatists control a fifth of its territory, to the great chagrin of Georgians. In other words, the two countries have given diametrically opposed answers to the fundamental question “What sort of relationship shall we have with Russia?” It is true that Tbilisi, since the 2008 war, has sought to improve its ties with Moscow. But there is still a gulf between the Russia policies of the two countries. Today’s Georgia aspires to be part of the European Union and NATO. Looking out for decades, Armenia sees its future in alliance with Russia. In 2015, when I was in Yerevan, I submitted some questions by e-mail to Armenia’s Deputy Minister of Foreign Affairs, Shavarsh Kocharyan, and he replied on November 18. Armenia has agreed to pay part of the cost of the base and this close alliance with Russia is not universally popular. One Armenian woman told me how cross she was that a restaurant in the country’s second city Gyumri had a menu only in Russian – Gyumri hosts the Russian 102nd Military Base. But the alliance is a fact of life. 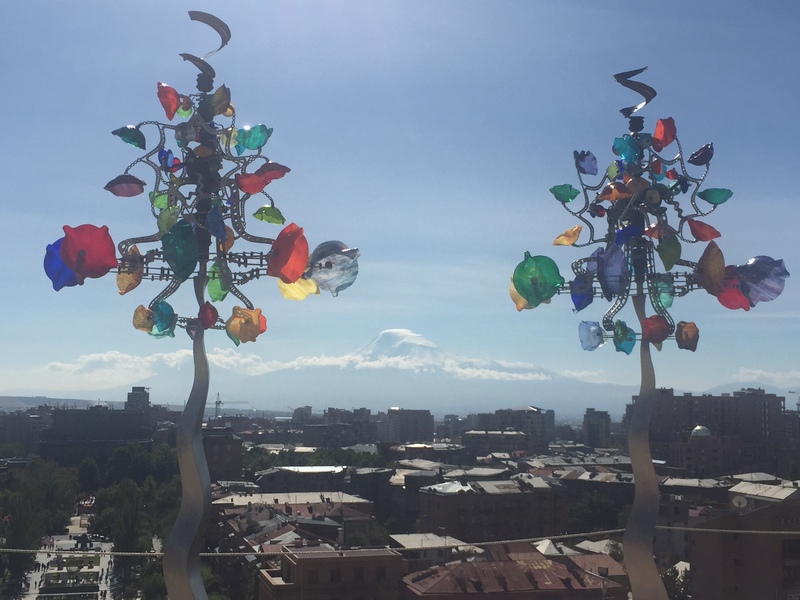 Not only is there a military pact, but Armenia is heavily dependent on Russia for energy supplies such as natural gas and fuel for a nuclear power station. Now Georgia’s leaders want to take their country into NATO. At the very least this would deepen the divide with its southern neighbour Armenia. 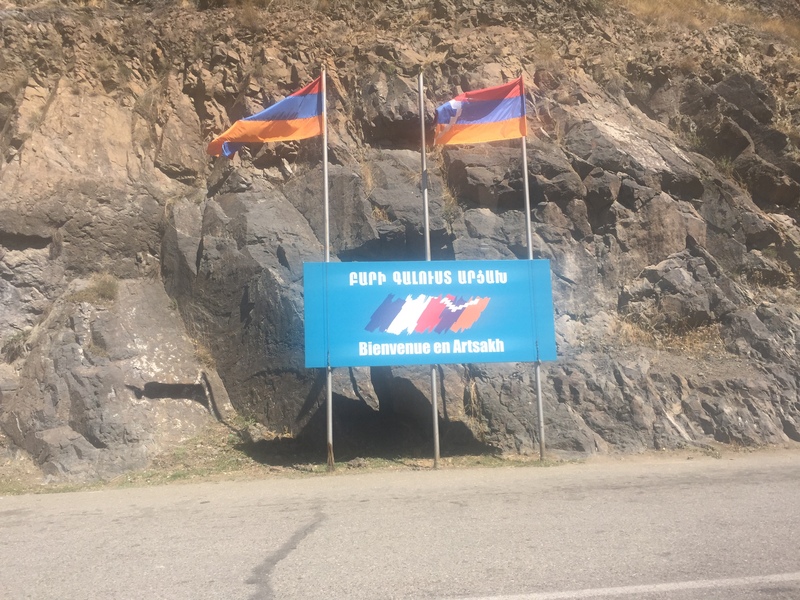 Mirroring the situation in Armenia, this pro-NATO stance does not enjoy full support in Georgia. I know my guide in Svaneti, Lasha Tkeshelashvili, believed Georgia should have a policy of neutrality. I don’t see how taking Georgia into NATO could make the Caucasus or the world any more peaceful. It doesn’t feel like wisdom. In a worst case scenario it could even be a trigger for a cataclysmic conflict between NATO and Russia. Extending NATO into the human fault lines of the Caucasus could make even less sense than building nuclear plants in an earthquake-prone zone. Why tempt fate? The pro-Russian alignment of Armenia is understandable when you look at the world from an Armenian point of view. A century after the Genocide, Armenians still see Turkey as the historical enemy and feel they need Russia as a friend. The Nagorno-Karabakh conflict also comes into the equation in a big way. Armenians are attached to holding onto this region, taken from Azerbaijan in war, and this attachment means they cannot afford to have Russia hostile to them. Even though it is allied to Armenia, Russia still sells arms to Azerbaijan. Russia is in a perfect position to stir up trouble, were the alliance with Armenia to falter. I asked the deputy foreign minister about the Armenia government’s view of the Russian arms sales to Azerbaijan. He made Yerevan’s unhappiness perfectly clear. One view among students of South Caucasus affairs is that it suits Russia for there to be no solution to the Karabakh conundrum. “Russia uses the conflict to keep its influence in the region,” said a political analyst from a European Union country in Yerevan. Over the years since the May 1994 ceasefire there have been attempts by the international community to settle this conflict, which still claims lives. But with bigger matters like the Syria war demanding attention diplomatic energy has drained away from Karabakh. I heard a telling comment from someone who took part in a meeting of the Organization for Security and Co-operation in Europe (OSCE) in Vienna in November 2014. It is the OSCE’s so-called Minsk Group which has sought to bring a peaceful settlement for Karabakh. This particular meeting looked at a range of international questions. “When Karabakh came up, some people left the room and others started texting,” the participant told me in a conversation in Yerevan. The conflict is one huge barrier to better political co-operation – soldiers facing one another on a front-line running from north to south at the heart of the South Caucasus make a mockery of any real attempt by governments to build regional unity. The Welsh call it “hiraeth”, while the Portuguese talk about “saudade”. It is nostalgia, a longing deep in the soul. It struck me on my travels that the people of this region are experiencing more than their fair share of “hiraeth”. The older people among the ethnic Armenians who now have Karabakh all to themselves long to stroll by the Caspian Sea along the Baku Boulevard as they did in their youth. But war has deprived them of that pleasure. There are trenches, guns and bullets between them and the sea – a border as firmly closed as any border can be. The ethnic Azeris who used to live in Karabakh but had to flee long for their homes and those glorious forested hills. But war has deprived them too. Ethnic Georgians forced out of Abkhazia during the bloodshed of the early 1990s long for their homes on the Black Sea shore. But war trumped their hopes. Too much unrequited longing is not good, but just possibly it can become a fuel for the creation of a better South Caucasus. I know of at least two initiatives that seek to transcend borders and I wish them well. The first is the annual One Caucasus Festival, which started in 2014 and brings together musicians and other creative spirits in the Georgian region of Marneuli. The festival’s website explains why this region was chosen as venue. The website says that funding for the festival is international, with some financial support coming from the governments of the United States and Poland, Warsaw City Hall and the French Institute of Georgia. The other project that straddles borders is the planned Transcaucasian Trail from the Black Sea to the Caspian. Given the political complexities of the Caucasus, it is remarkable that brave souls have embarked on this venture. In years to come, this has the potential to be second to none among the great trails of the planet. Each of the two intersecting trail corridors will be about 1,500 km long and the website says that the work to create these trails will unfold over the next five years. The spirit of Douglas Freshfield is surely following all of this with keen interest. I salute these initiatives with all my heart. Lovely piece Steve! Entirely agree with your analysis about Russia as the bear in the room and would even say you are not forceful enough about the persistent Russian belief that they have a missionary role in the world, the third Jerusalem, expounded by the Russian Orthodox Church among others. On another point were the motives for their imperialism much different from the mercenary causes of other countries, including our own? Indeed given they propound their exceptionalism and missionary role so forcefully, but have historically been led so inhumanely ( and Aleppo and before that Grozhny are examples in our time) one might say it all leads to that deep feeling of contradiction and intellectual impotence that Chekhov expresses so forcefully. At all events a terrible neighbour to have! What a wonderful insight. I hope you’re sending it to Putin and Trump! As for ” infatué”: it’s certainly in my dictionary…Le Petit Robert! Thank you Jo! It is good to know that “infatué” is in Le Petit Robert.